A few years ago, the developers of the ever-popular fighting game Tekken paid homage to Jose Rizal by adding a playable female fighter, Josie Rizal, to the seventh installment of the game, to mixed reactions. (Mostly: why?) In truth, even though the thought of a foreign entity turning one of our greatest national heroes into a fighting game character wearing a skimpy skirt sounds like the textbook example of cultural appropriation, I can’t bring myself to hate it. Tekken is a silly fighting game, and Josie is just emblematic of its silliness. To me, it manages to be too weird to be offensive. This is what I thought about when I saw the Kickstarter page of Bayani, an upcoming fighting game featuring characters based on different figures of the Philippine Revolution. It’s made by an all-Filipino team, which already puts them above the people behind Josie. And I guess it’s not that strange to reinvent Jose Rizal as a video game character: the man, after all, created his own board game while he was in exile in Dapitan. Still, there’s something unsettling about the game to me. 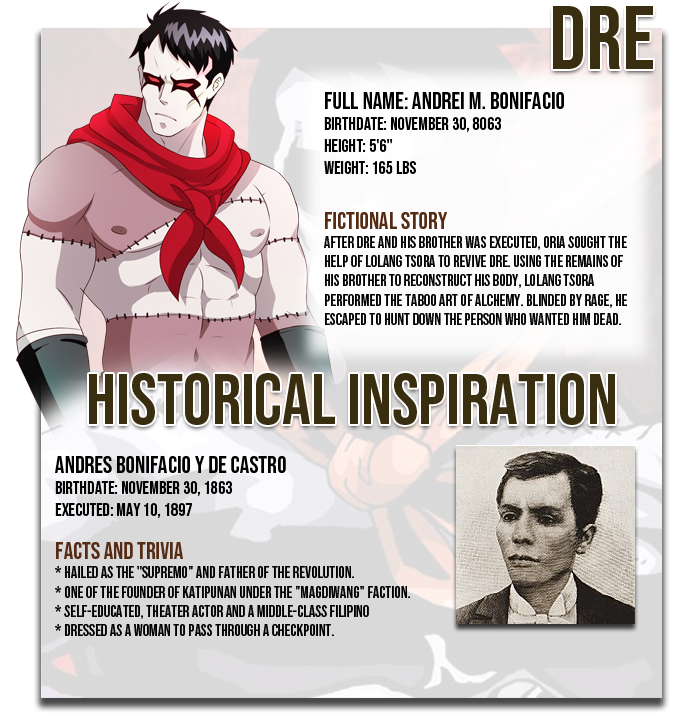 It’s set in bizarro land where Lola Tsora, the character based on Tandang Sora, has mystical powers strong enough to resurrect the Frankensteinian corpse of Andres Bonifacio. It’s also somehow set in the future. It’s a problem owing to its genre: because it’s a fighting game, there’s no time to be bogged down by sensitive details like history. No one wants to talk about the failure of a revolution, the events that sparked Apolinario Mabini to write, “Ang ganitong gawang linsil ang unang pagtatagumpay ng hangaring makasarili laban sa tunay na pagkamakabayan,” in one of his letters chronicling the Revolution, when they’re playing a silly fighting game. Then again, maybe that’s the kind of thing we need right now: a kooky fighting game that puts our history into a blender and lets us forget for a moment that the world is on fire and our government can’t even stop cultural artifacts from being auctioned off to private collectors. It’s an escapist fantasy, sure, but in a time when it seems like the entire world is slipping into authoritarianism, why not play a game set in a post-apocalyptic Philippines that somehow was able to bring back our heroes?